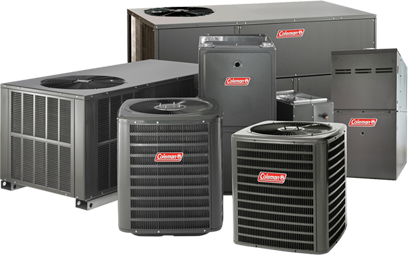 A “split system” central air conditioner includes a compressor, fan, condenser coil, evaporator coil and refrigerant. The system removes heat from indoor air and transfers it outside, allowing the indoor air to be circulated and cooled (which is measured by SEER, Seasonal Energy Efficiency Ratio). A central air conditioning system uses electricity as its power source. A cozy family gathering, a relaxing evening, a quiet winter’s morning—your comfort needs change throughout the day. 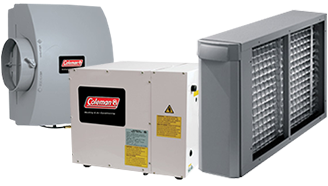 And when a Coleman® furnace is properly matched with a Coleman® air conditioner or air handler, you will enjoy extended system life and maximum efficiency all year around! 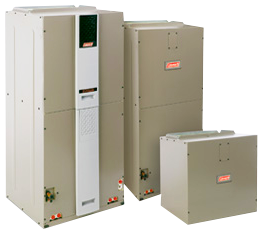 The Echelon™ 9.C is one of the highest rated gas furnaces in the industry (up to 98% AFUE). The EnergyGuide label outlines the energy use and efficiency of major home appliances. The Echelon™ 9.C EnergyGuide rating exceeds government standards – insuring exceptional quality and low energy use. Whole house humidifiers, like our Echelon powered and bypass units, work to keep your home comfortable year after year—all from one centralized location in your home. Single room humidifiers, on the other hand, can be expensive and are limited to the room you are in. In order to maximize the unit’s effectiveness, you would need to purchase a unit for each room in your house. Echelon bypass and powered humidifiers are ideal for all homeowners who have a central home comfort system. By providing humidity control throughout your entire home, the effects of dry air such as dry skin and static zaps are reduced and you experience greater comfort all year long. Your home’s air can be up to 100 times more polluted than the air outside. Echelon humidifiers regulate the humidity in your house, helping to ward off bacteria, viruses and fungi while reducing allergic and asthmatic reactions. With moisture being added to the air, your home will feel warmer so you’ll lower your thermostat and, in turn, your utility bill. Lowering your thermostat by as little as three degrees can reduce annual heating bills by as much as five percent. Now you can feel in control of your home’s environment from anywhere using iPhone®, iPad® or Android® mobile devices, thanks to the new Coleman® Echelon™ Residential Communicating Control with Wi-Fi®. The revolutionary Echelon™ Residential Communicating Control with Wi-Fi® reaches out and “talks” to all your Echelon™ home comfort equipment to ensure each one is working together at maximum efficiency. 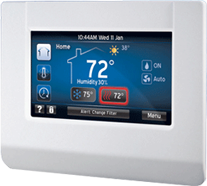 From your air conditioner, to your furnace, to other system accessories, the Communicating Control takes advantage of advanced digital technology to build a real-time system profile, ensuring top performance and ideal comfort. Your system gets the intelligent instructions it needs. You get a simple touch screen control on the mobile device in your hand that looks like the smart thermostat on your wall! Phone home to your comfort zone—Download Intellicomfort™ app for iPhone®, iPad® and Android® mobile devices to connect from practically anywhere! Control One or More Homes While Away—Easily program multiple custom daily events and vacation schedules on your thermostat, as well as home/away settings on your smartphone, for greater energy savings. Easy Programming — Take the pain out of programming with an intuitive, user-friendly interface. Multilingual Interface — Available with English, French or Spanish text options. Convenient Email Reminders — Email option automatically sends service notifications to eliminate guesswork on maintenance status. Quick Heat and Cool Feature — Get the comfort you need when you need it. Zoning Capabilities – Configure comfort levels in each area of your home for more consistency and efficiency.